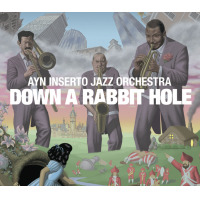 Ayn Inserto is a young, beautiful and very talented composer who has just made a dramatic entrance into the world of big band jazz, offering a new voice on this debut album. Her music is new and unconventional, striking a different chord than what one usually expects from a big band project. Inserto assembled her sixteen-piece Boston-based orchestra with some of the best local talent. A student of legendary trombonist Bob Brookmeyer, who likens Inserto to Maria Schneider, she recorded this album with her mentor and reed man George Garzone as special guests. Except for three tracks penned by Garzone, the balance consists of original compositions and arrangements provided by the leader. What is clearly evident here, right from the opening "The Mingus That I Knew, is that you will not be treated to a typical big band sound. 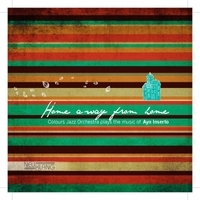 The charts are sophisticated, with intricate lines and texture characterized by direction-changing moods and tempo. The composer crafted the entire album around her two guests, who provide a slew of tasteful solos. The opening tune features an impressive performance by Garzone, who continues his assault on tenor and soprano on his own "Hey Open Up, "Just Blow and the finale, "The Chooch, a wild and humorous piece containing the only vocals (also provided by the saxophonist). Bob Brookmeyer shows his stuff on Inserto's "Shadow Dancing With a Hint of Gold and "Early Sunday Morning, and then shares the spotlight with Garzone on "Lazy Saturday Afternoon and the title cut. I have to be perfectly honest and state that it took me a couple of listens to truly appreciate the fresh new sound that differentiates this album. I suspect that we will be hearing more from Inserto in the future, and rightly so. 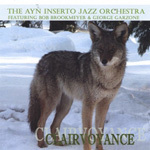 Ayn Inserto's sophisticated charts and clever arrangements on Clairvoyance serve to harness that energy to create a unique big band sound without the heavy orchestration. Track Listing: The Mingus That I Knew; Shadow Dancing With a Hint of Gold; Hey, Open Up; Clairvoyance; Lazy Saturday Afternoon; Early Sunday Morning; Just Blow; The Cooch. Personnel: Ayn Inserto: director; Bob Brookmeyer: trombone; George Garzone: tenor and soprano; Jeremy Udden, Rick Stone, Bill Jones, Kelly Roberge, Hans Spencer: reeds; Jeff Claassen, John Economy, Pete Kenagy, Mathew Small: trumpet ans flugelhorn; Jaff Galindo, Christian Pincock, Garo Saraydarin, Chris Gagne: trombone; Mike Gamble: guitar; Kyle Aho: piano; Jeremy Allen: bass; Richie Barshay: drums.